Mixing Systems: What is a Nutating Shaker? Laboratory mixing systems typically introduce mechanical agitation via rotation, stirring, rocking, shaking, or through the induction of a vortex. These may be suitable for simple solutions, but mixing systems often require additional functionalities to effectively homogenize more complex samples. Solutions comprising immiscible fluids, constituents of varying densities, or dispersive particles that are subject to gravitational separation from the mobile phase, will not mix well in response to two-dimensional agitation. Swirling a heterogeneous solution around an orbital axis, for example, offers only limited vertical mixing action. Shaking is one of the oldest methods of laboratory mixing as it could be easily achieved by hand with stoppered flasks. As process automation became a key component of high throughput sample preparation, the cost-efficiency of mixing by hand was rapidly outweighed by its time constraints. Many mixing systems were subsequently developed to replicate and automate this back and forth shaking action. Yet even this tried-and-tested method is limited with respect to its degree of dimensional capabilities. A nutating shaker combines the functionalities of a robust laboratory shaker with an additional circular rocking motion. Samples are simultaneously shaken and oscillated around a central axis, providing a three-dimensional agitative action that ensures samples are mixed across vertical and horizontal strata. Mixing systems that achieve this full range of motion are typically characterized as either low volume or high footprint devices. Benchtop systems are considerably more space efficient but are typically limited with respect to the size and number of sample containers that they can house on their oscillating platform. 3D floor shakers, meanwhile, offer significantly higher volume capacities but are less economic with regards to laboratory footprint. Glas-Col’s nutating shaker eliminates the need for compromise between device footprint and volumetric capacity. It is an economic, benchtop mixing system with capacity for up to four 2-liter separatory funnels at a maximum total load of 40 lbs. The glassware holders will also accommodate Erlenmeyer flasks. 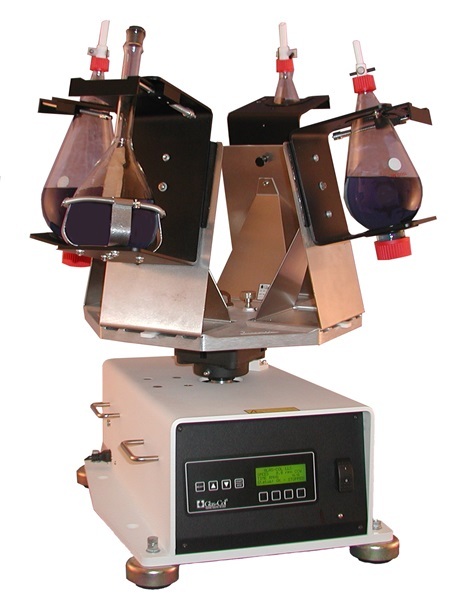 This unique mixing system is based on a Lazy Susan-style turntable design which allows 360° of platform rotation to facilitate easy glassware loading while the mixing system is positioned within a fume hood. The nutating shaker from Glas-Col is a mid-range mixing system with a continuous-duty 1/5-HP motor capable of producing between 10—170rpm. Glas-Col provides an extensive range of analytical solutions and laboratory instrumentation for facilities across the world. If you would like to learn more about our mixing systems, read our previous blog post: Mixing Products for Water Pollution Analysis. Otherwise, contact us directly with any questions.